About 70 per cent of visitors to Central Bohemia and the Czech Republic in general direct their steps to Prague, a city which is rightly considered one of the most beautiful world metropolises. Prague owes its popularity mainly to its unique architectural and cultural monuments spanning virtually all historical periods of its one-thousand-year old history. The first written record mentioning Prague, "a city made of stone and lime", dates from 965 and comes from the Jewish merchant Ibrahim ibn Jakub. In 973, a bishopric was founded in Prague and in 1172, the construction of Judith Bridge, one of the first stone bridges built in Europe, was finished. Prague has gradually become the seat of the Czech princes and kings, and the emperors of the Holy Roman Empire. During the reign of Charles IV (the 14th century) and Rudolph II (the turn of 16th and 17th centuries), the city ranked among Europe's leading scientific and cultural centres. Charles University, founded in Prague in 1348 as the first institution of higher learning established north of the Alps, played a significant role in the development of education and culture in Central Europe. At the beginning of the 19th century, the Czech philosopher and matematician Bernardo Bolzano ascertained that Prague had 103 towers and spires. This inspired its epithet "the city of a hundred spires". 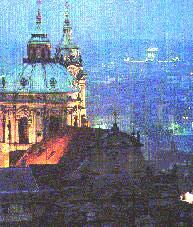 According to estimates the current number of Prague's spires reaches 500. Prague can offer to its visitors a wealth of remarkable architectural monuments, a perfectly blended composition of Romanesque, Gothic, Renaissance, Baroque, and Art Nouveau edifices. The city's charm enchants every new tourist like it enchanted millions of visitors before. Prague's historical center has been declared protected area. Its heart is a medieval town built on the site of an older Romanesque settlement and comprised of the Old Town (around 1232), the New Town (1348), the Jewish Town, the Lesser Town (1257), Hradcany (the first half of the 14th century), with the Saint Vitus Cathedral, and Vysehrad. Prague Castle, the seat of the czech kings from the 9th century, and of Czechoslovak (since 1918) and Czech (since 1993) presidents, was originally a Slavic settlement, rebuilt in the 11th century into a stone Romanesque castle. Prague Castle's current appearence is a result of a number of modifications, additions (until the 18th century), and renovations. Adjacent to Prague Castle is Hradcany, originally the outer bailey of the castle raised to a burgravian (tributary) town at the beginning of the 14th century. A number of beautiful edifices belonging to nobility and to church dignitaries sprang up here: (Schwarzenberg, Cernin and Sternberg palaces, the Loretto grounds and the Strahov Monastery). Below Prague Castle is the Lesser Town, a picturesque town quarter containing a multitude of Renaissance and Baroque houses, palaces, and churches. Beautiful Baroque gardens spread at the foothills of Prague Castle and on Petrin slopes. The Lesser Town is connected with the Old Town by Charles Bridge (1357), a mighty stone structure adorned by an array of sculptures. The Old Town was constitued as a town community. Its area contains a number of well-preserved Romanesque, Gothic, Renaissance, and Baroque edifices: the Powder Tower, once a part of the fortification system, the Old Town Hall with its famous "Orloj" (an astronomical clock), the Church Of Our Lady, St. Nicholas' Church, St. James Church, St. Giles' Church, the Clementinum, the Church of the Knights of the Cross, the Carolinum and the Estates Theatre. In the area of former Jewish town, which was subjected to a major clearance in the 1890s, several remarkable historical monuments have survived, including Gothic Synagogue and the Old Jewish Cemetery with a number of gravestones of intrinsic value. The New Town was founded on the site of several ancient diffused settlements located on the outskirts of the Old Town. Several public buildings, including the New Town Hall, the Church Of Our Lady Of the Snows, the National Theatre, the church and the monastery Na Slovanech, and Vysehrad, the Premyslid dynasty's second Prague seat, renovated by Charles IV and rebuilt in 1654 into a Baroque fortress, have survived to our times. The Vysehrad grounds contain a church consecrated to Ss. Peter and Paul and a cemetery which was transformed in the 1860s into a burial place for the most outstandings sons and daughters of the Czech nation. Closely linked to Prague's history are the two oldest Czech monasteries - the Convent of St. George (973) and the Brevnov Abbey (993).